Thanks to Nathan for sending me the above radar captures from Friday's storm. Also thanks to Rick Lipscomb for his radar support as I followed the storms. Storm surveys are underway by the Huntsville and Birmingham NWS Offices. Friday April 11 thankfully looked more scary than it turned out to be. 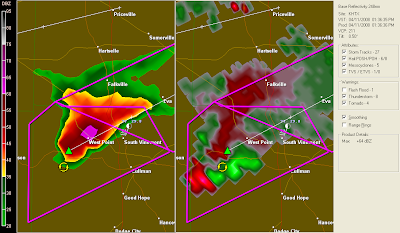 There were numerous reports of wall clouds, funnel clouds, and NEXRAD radar images of hooks and rotation. Thankfully, all of this resulted in no known injuries in Alabama, and very scattered damage reports. I suppose that made it an ideal day to chase storms, if there is such a thing in Alabama. Friday was a textbook case as to why chasing is so difficult in the South. These were better conditions than normal to spot storms, but it was still difficult at times. After eating lunch with the unit I supervise at work, I checked back on the weather situation. Much of Alabama had been placed under a tornado watch and James Spann was streaming live on ABC3340.com for a tornado warning in Marion County. Storms were popping up rapidly, more than forecast by the meteorologists and models. 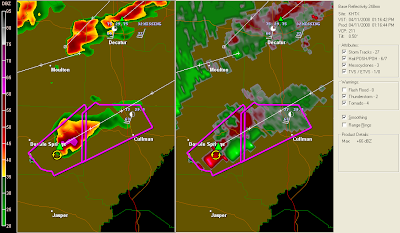 I was most concerned about the storm near Glen Allen in Marion County, Alabama. I looked at the radar and determined that it was about an hour away from western Cullman County, where my boys attend school. I was dismayed to learn that the schools in Cullman County were releasing students at 1 p.m. By my calculation, that was very close to the time when the mesocyclone in Marion County would be in the area where my boys' school is located. I called my ex-wife who was in complete agreement with me. She began high-tailing it to the west out of Cullman. Our goal was to get our kids out of harm's way before the storm hit. She wasn't sure she would make it. She did, and I was thankful. As she and I were talking, I heard reports of damage out of Winston County from fellow storm chaser, Brett Adair, who was streaming live video back to James Spann at ABC 33/40. My concern now was for the students in Cullman County who would be in buses as a mesocyclone with a possible tornado was headed their way. While all this was going on I was updating co-workers on the weather situation and letting them know that I was thinking about leaving at 1:00. I emailed my boss, who, after asking me if I was storm chasing and showing concern for my children, graciously allowed me to take leave. I was relieved to learn that my ex wife had gotten our children to shelter ahead of the storm. Credit is due her for driving them to three separate shelters as they dodged three tornado-warned mesocyclones Friday afternoon. I decided to head south to either I-65 Exit 308 (Hwy 278) or a little further north and closer to the storm at Exit 310 (Hwy 157). Out of caution I first headed to Exit 308 and began communicating with James Spann via his Skywatcher IM conference. It soon became evident by listening to Spann and Jason Simpson on FM 97.3, as well as looking at the sky and the radar on my laptop, that it would be safe to drive two miles further north to exit 310. From this point I began photographing and taking video of a very impressive wall cloud and beaver tail inflow cloud northwest of Cullman. This storm was clearly rotating and occasionally producing cloud to ground lightning. It was amazing to behold. I followed it to the northeast. I remained to the southeast of the storm as I drove northeast through Cullman County on highway 157 and then highway 69. I entered Marshall County at Arab and continued all the way to Guntersville Lake. I stopped there and took video and photos of the storm as it passed about 6-10 miles northwest to northeast of my location. I learned today that the storm produced two small EF0 tornadoes while I observed it 6-10 miles away. Although I could clearly see the rotation, the wall cloud and tornado were wrapped in rain. I did see an increase in cloud to ground lightning output that probably coincided with the tornado touchdowns. I was careful as I drove, but I must admit I spent a lot of time glancing out of my side window or out of the left side of my windshield to my northwest. As I drove through Cullman, Fairview, Baileyton, Joppa, Arab, and on to Guntersville Lake, I saw a wall cloud the whole way. The only point it seemed to weaken turned out to probably be an illusion. In northeastern Cullman County, the storm was a bit further away than the rest of the route. The wall cloud was there and at times it seemed quite large. It makes me wonder if there would have been a large wedge tornado if there had been just a bit more directional shear near the surface. Thankfully, that did not happen. I drove south out of Marshall County through the eastern side of Blount County before returning home to pick up my kids. I saw some very heavy rain and some minor flooding, but no more signs of major rotating storms. I stopped at a country gas station near Blountsville that was being run by a mother and her adult daughter. They were gracious enough to allow me to charge the battery on my laptop. The daughter told me she was a single mother of a nine year old boy who was scared of storms. My suggestion to her was to educate him as much as possible. She wanted to know how to get James Spann to speak at her son's school. I suggested that she ask his teacher to email Mr. Spann. She was financially very poor so I suggested that she take her son to the library and that they read everything they can about weather and storms. What a day! I won't forget it soon.